Those who were recruited as casual workers by the Electoral Commission in December last year for the referendum on the creation of new regions are demanding their unpaid allowances from the Commission. Those recruited for the exercise in the newly created North East Region; say the EC has failed to communicate to them after the exercise ended over three months ago. They told Citi News the EC would have to pay them immediately to enable them sort out their personal issues. “We want to find out from the Electoral Commission of Ghana and government when we are going to be paid our allowance and how much each of us is going to receive,” a worker said. “Three months down the line, We do not know how much we will be paid. We want to find out from government and the EC whether they are going to pay us,” another said. Some electoral officers who were engaged by the EC had earlier also indicated that they are yet to be paid. 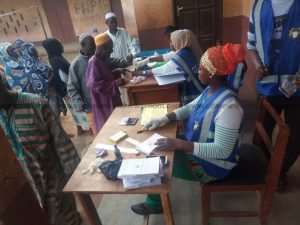 Some polling officers who supervised the process in the Savannah Region complained to Citi News, saying the delay in their payment is affecting them negatively. Prince Idris, one of the affected persons, urged the government and the Electoral Commission to pay them. Voting took place in the Volta, Western, Brong Ahafo and Northern regions which resulted in the creation of six new administrative regions, Oti, Ahafo, Bono East, Western North, Savannah and North East. Staff engaged by the EC for exercise have been complaining about delayed payment in the past. Ahead of the 2016 election, some persons contracted by the EC to conduct the exercise in the capital, Accra, complained that they were in the dark concerning their remuneration . This personnel were partaking in the voters’ register exhibition exercise at the time. In the Tamale Metropolitan Area, recruits threatened to boycott the exercise over the allowances. According to them, their checks revealed that their colleagues in other regions were to receive GHc720 whereas they were to collect GHc400 at the end of the exercise.